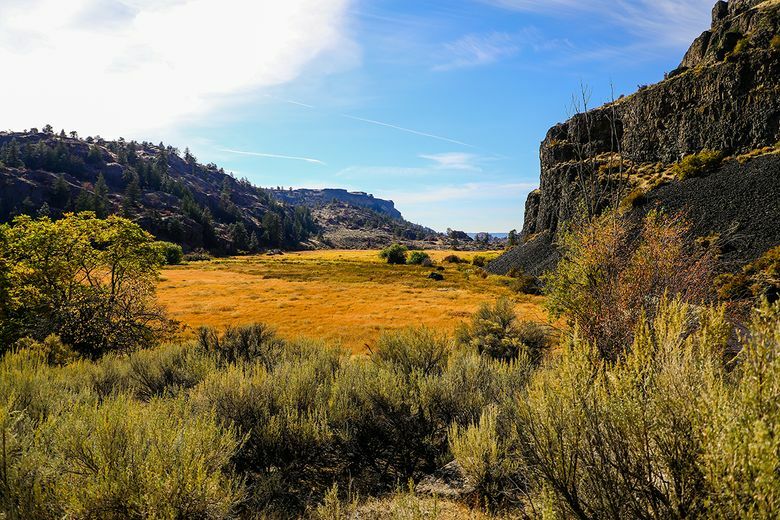 Okanogan Country, land of soaring mountains, high plateaus, winding river valleys and breathtakingly clear views, is considered by some to be the very northernmost tip of the Great Western Desert, which stretches all the way up from Mexico. 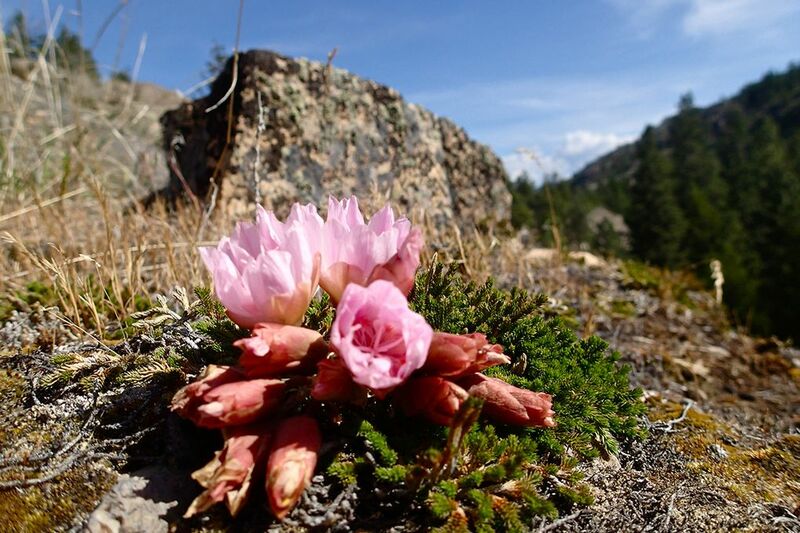 Regardless of what it’s called, the high desert in Okanogan Country creates beautiful spring hiking experiences. The desert landscapes come briefly, brilliantly and exuberantly alive. Wildflowers, including mariposa lilies, fireweed, larkspur, phlox and bold yellow balsam root bloom extravagantly across the mottled gray-green-black backdrops of sagebrush and granite escarpments. The sun is warm; the shadows cool. People are scarce, and it’s nearly a religious experience to hike the rocky trails under the bluest sky imaginable. 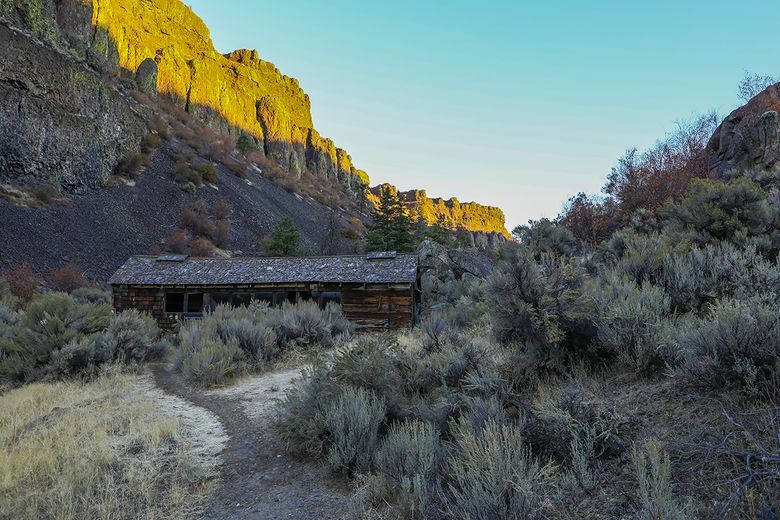 Pack hiking shoes and plan a weekend adventure to explore some of these unforgettable — and little-known — gems in the high desert beauty of Okanogan Country. 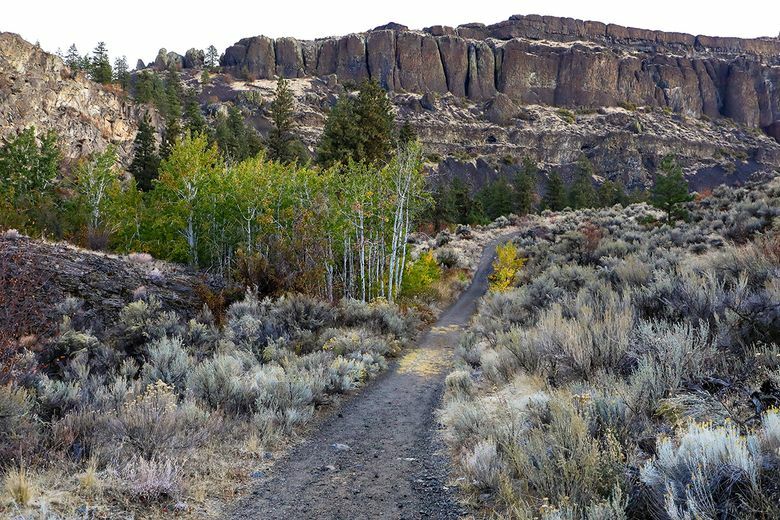 Overview: This fairly strenuous trail wanders through Northrup Canyon in Grant County (yes, this trail is outside of the Okanogan County line, but just by a few miles). The trail climbs into the canyon, which holds the only native forest in Grant County. Pines, willow and aspen provide rich habitat for birds and wildlife. Take your time; the trail is steep in places and especially challenging past the old homestead. Notes: This is a spectacular place for bird-watching. Hundreds of bald eagles have been known to roost in this canyon in winter. Red-tailed and Cooper’s hawks patrol the skies, hunting for prey in this dramatic shrub-steppe habitat. Other species include barred and great horned owls, grouse, quail and flickers, woodpeckers and swarms of swallows that call the cliffs their home. There was once an orchard here, remnants of which are still visible, and observant visitors might spot the old stagecoach trail to the south. If you choose, you can keep going past the homestead another 1.5 miles to discover Northrup Lake, which makes for a 6-mile round trip hike. Overview: Though the Candy Point Trail is only a 2.25 mile round trip, this unique outing packs a wealth of history, engineering, wildlife biology, jaw-dropping panoramas and a challenging cardiovascular workout (700 feet of elevation gain) into its relatively short length. 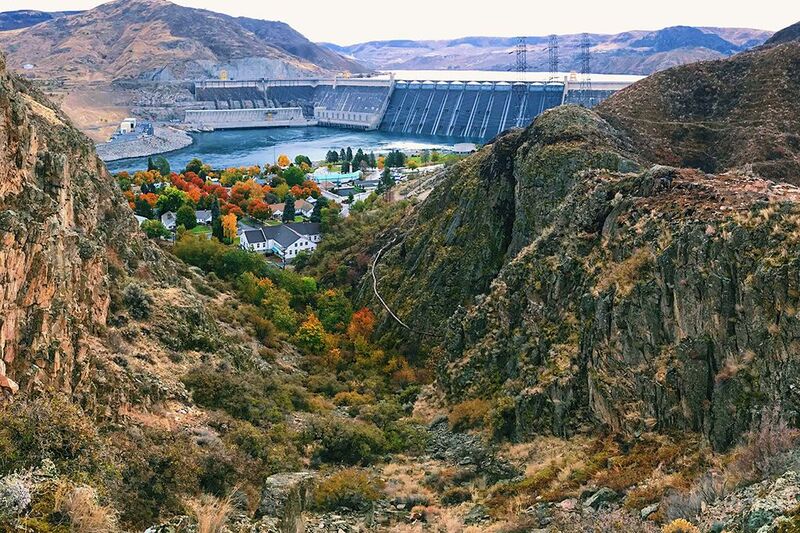 Once back on level ground, you can round out your day with a walk through Grand Coulee Dam’s quietly shaded historic district and the evening light show at the dam. Built by the Civilian Conservation Corps in 1937 and revitalized by the local Rotary Club in 1991, the trail is instantly recognizable as a set of hand-laid stone steps leading sharply uphill from a well-maintained lawn. 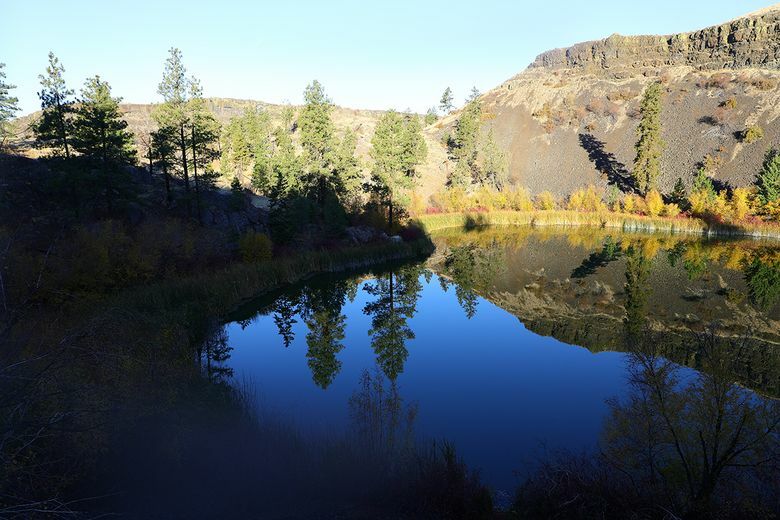 Note the words “sharply uphill” because the trail gains almost 700 feet of altitude as it rises through a narrow canyon and up to a distinct promontory which affords great views of the town, the dam and the “scablands” beyond. Signage is excellent and you can make the outing into a 2.25 mile loop by following the trail around to the old railbed and back down to the town hall. Notes: Those more interested in a water-oriented outing should consider the Downriver Trail, which provides a 6.5 mile out-and-back on a compacted gravel trail along the east shore of Rufus Woods Lake (the Columbia River). The trail is located just south of Grand Coulee Dam and is appropriate for strolling, biking, jogging or walking the dog. Overview: A true jewel. This wide and flat “Rails-to-Trails” project follows the old Washington & Great Northern rail bed as it winds along in parallel to the river. Paved and graveled over most of its length, the trail is good for walking, running, biking, birding and wildlife viewing. The trail is low angle and easily followed. If you prefer an easier hike go just as far as the old girder bridge that spans the river before turning around (2 miles round trip). For a longer option (4 miles) hike all the way to Similkameen Falls overlook before turning around. Notes: Look for dredges and other relics of the river’s gold-mining past. Overview: A scenic network of multiuse trails, Whistler Canyon provides an endless range of options for exploration, birding, rock climbing, horseback riding, photography and wildlife viewing. Depending on which paths you take, out-and-back routes can range anywhere from a moderate 3-mile hike to a challenging 24-mile calf-crusher with elevation gains of 3281 feet. A trailhead map board will get you oriented but a Green Trails or USGS map will prove useful if you are planning on taking any of the longer cross-country routes. Please note that the trail is steep at first but quickly provides relief in the form of magical views of the Okanogan Valley, the distant Cascades and the eastern escarpment of the Pasayten Wilderness. Notes: Study the steeper rock faces for mountain goats or try to spot the bolts used by modern rock climbers. Overview: Located 7 miles south of Tonasket, the Carter Mountain wildlife unit includes over 2,240 acres of federal shrub steppe, dry grasslands and mixed conifer forest. Known for its abundant wildlife and rich diversity of plants, the preserve is also home to golden eagles and a wide variety of migratory birds. Private property borders a significant portion of the Carter Mountain Unit, so please respect private property and heed the posted signs where vehicle access is not permitted. A variety of easy to moderate hiking trails ranges all over the terrain, varying from broad valleys to rugged, rocky hillsides, providing a host of out-and-back or loop trails. Notes: Bring your binoculars! 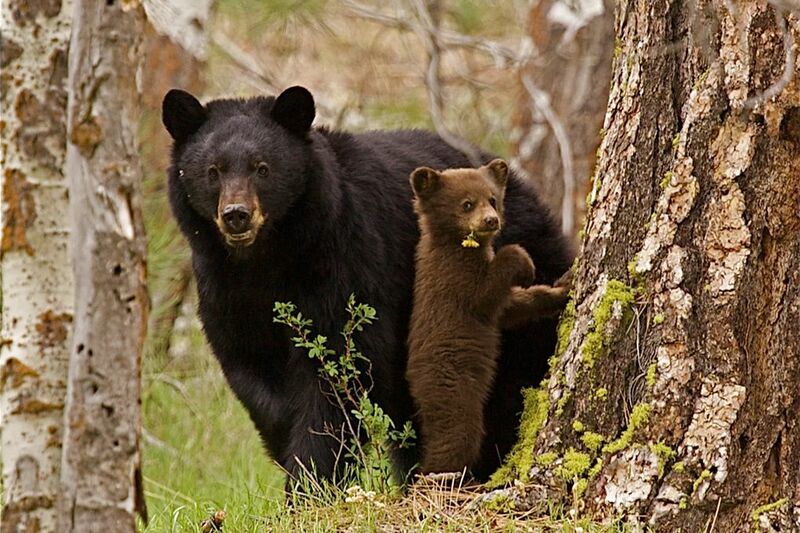 Carter Mountain supports a thriving population of black bears, mule deer, cougars and bobcats.